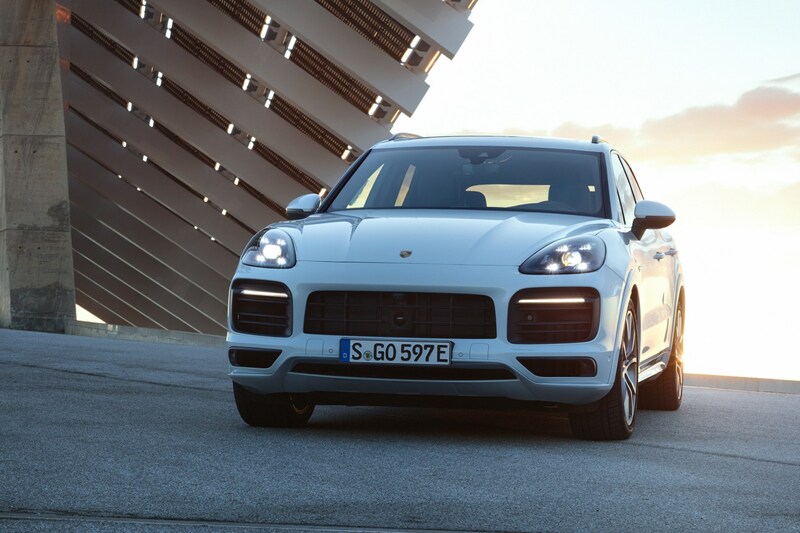 Porsche has officially revealed its latest Cayenne variant, the e-Hybrid PHEV. After its stint testing in South Africa, Porsche’s new plug-in electric SUV has gone on sale, priced from £67,128. A 3.0-litre V6 is mated to a 100kW electric motor for a total output of 456bhp and 516lb ft of torque and a 0-62mph time of 5.0 seconds – quicker than the Cayenne S but not quite as rapid as the Turbo. Due to the PHEV powertrain, Porsche can claim up to 27 miles of EV-only range and up to 69.2mpg on the NEDC cycle. Porsche says the electric powertrain’s boost strategy has been sourced from the 918 Spyder, so it can use the standard-issue Sport Chrono pack for additional boost. 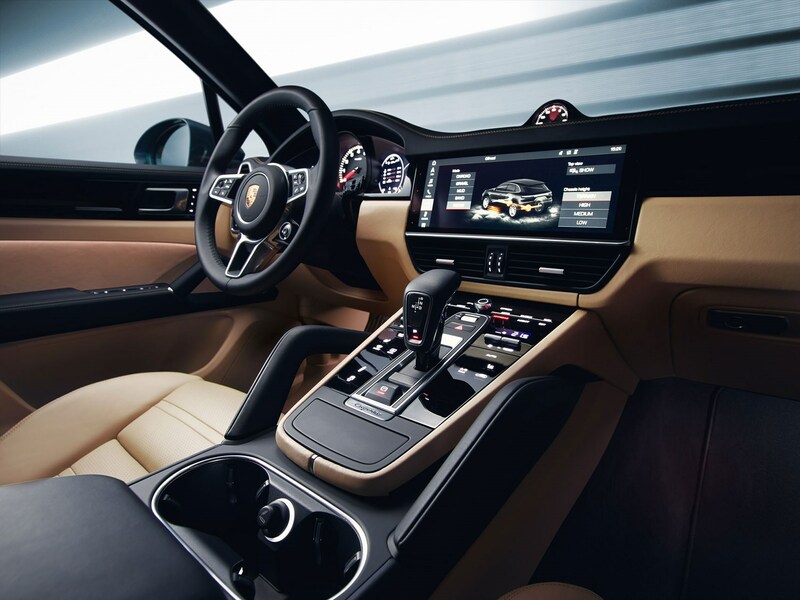 Porsche has also added a couple of new options, including a head-up display – the first for a Porsche – plus massage seats, the clever InnoDrive ‘digital copilot’ system and a heated windscreen. 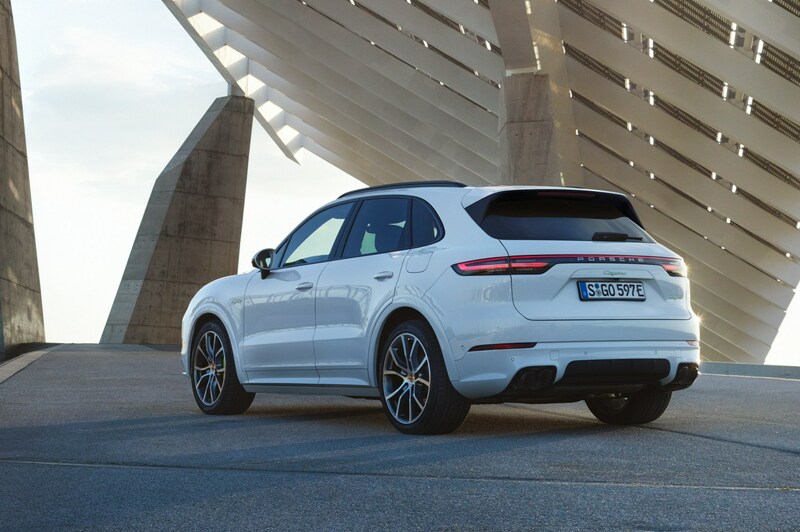 Ever wondered what the result would be if you took the Macan’s 911-inspired styling and applied it to the Porsche Cayenne? Well boggle no longer, because here it is in all its glory, set to hit roads in April 2018 after a Frankfurt motor show debut. 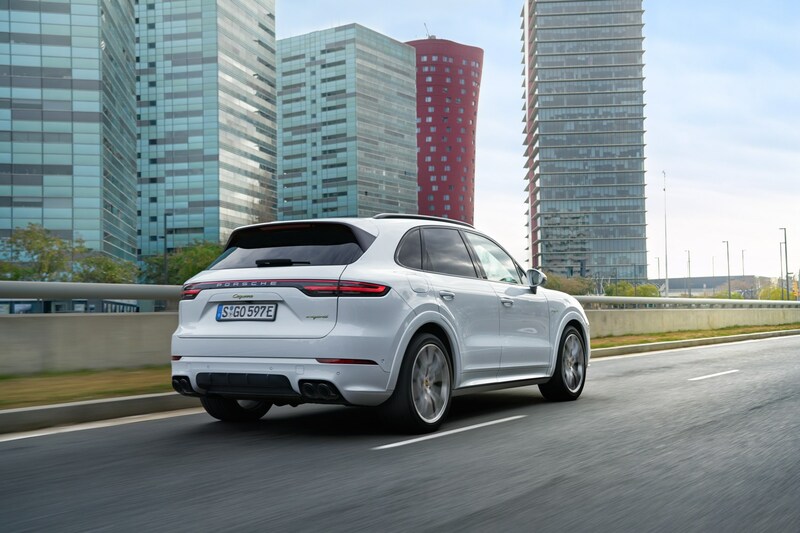 It has a pair of tough acts to follow, with the first Cayenne the car credited with Porsche’s turn of fortunes from near-bankruptcy to the formidable organisation we know today, and the second selling half a million of the 760,000 units sold worldwide. This is a popular car – though now less so than the smaller Macan – and so you can understand the firm’s reluctance to change the formula too much. Thus we have iterative design improvements, the most noticeable of which is that rear end inspired by the 911. 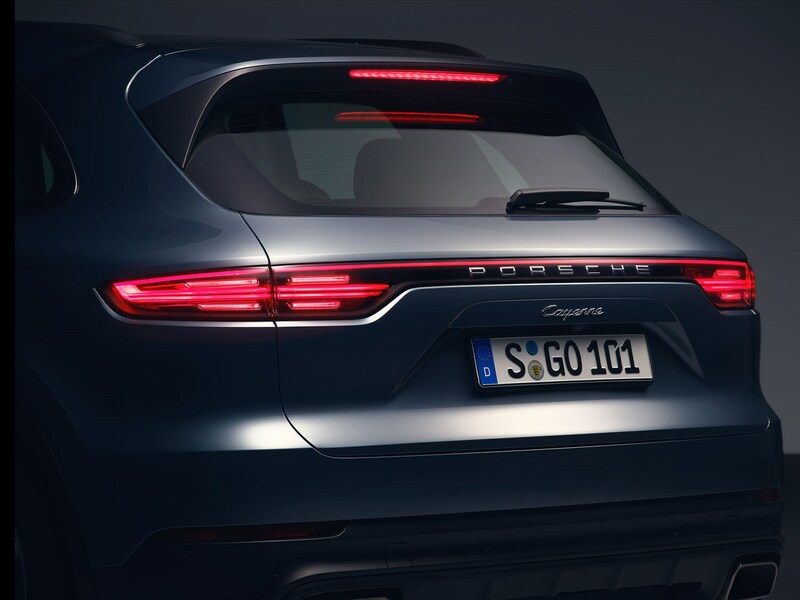 We’re rather fond of the way the two 3D rear light clusters are joined using a thin strip of LEDs and the 3D Porsche logo nestled behind a perspex panel just below. From the front, there is less visual distinction between the new car and the Mk2 Cayenne, apart from the enlarged air vents – something engineers demanded for better cooling in forthcoming models. LED lamps are standard-fit across the range. 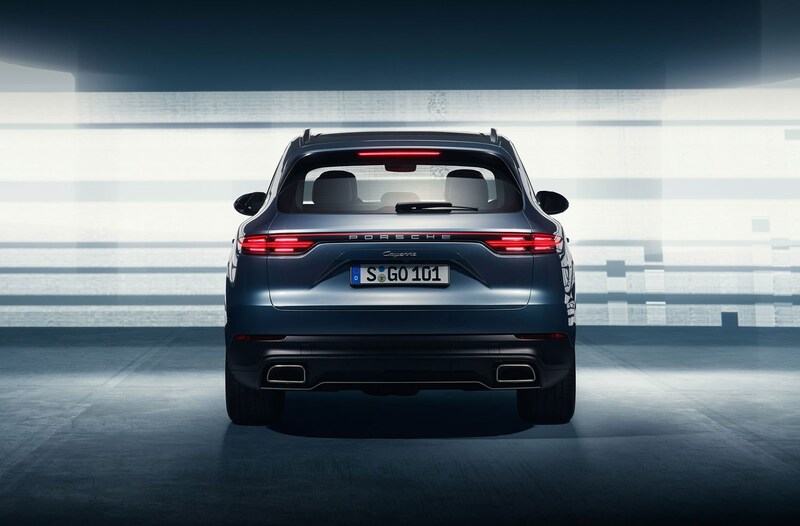 Its proportions amplified in the quest to SUV-ise sportscar lines, the third-generation Cayenne sits atop the very same underpinnings as the Audi Q7 and Bentley Bentayga, so it’s no surprise to find many of the same sorts of equipment making its way into the Porsche – albeit with a slightly sportier gait for Stuttgart’s largest SUV. That means a 48-volt backbone-powered active anti-roll tech, three-chamber air suspension (the advantage of which is more accurate control of vertical wheel movement and a bigger range between Comfort and Sport settings), rear-wheel steering and a selection of drive modes – including Normal, Mud, Gravel, Sand or Rocks. This is all added to a lightweight chassis design using a 'separated link' front set-up and multilink rear suspension. It’s set to take on the likes of the BMW X5, Range Rover Sport, Maserati Levante and Jaguar F-Pace. What’s under the bonnet of the 2018 Porsche Cayenne? Initially it’ll launch with a choice of two engines and one gearbox – an eight-speed Tiptronic S auto with shorter low gears and a longer eighth for better cruising capability. 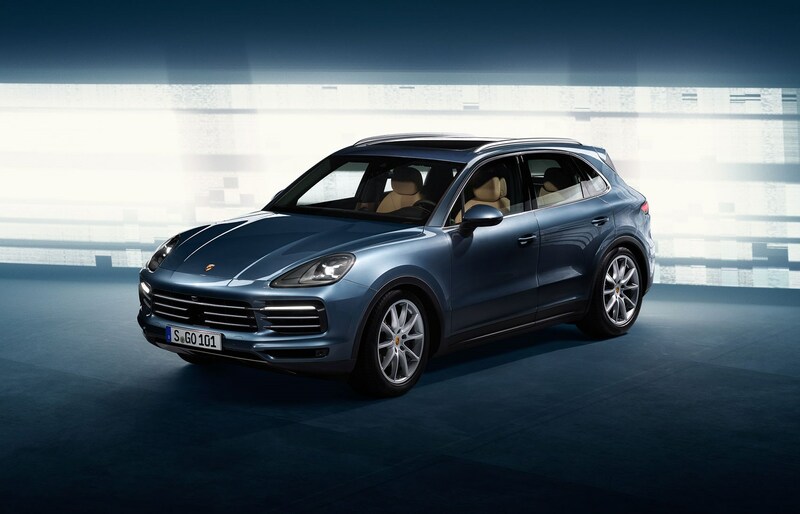 The standard Porsche Cayenne comes with a 3.0-litre V6 turbo motor (336bhp/332lb ft) for 6.2 seconds to 62mph and 152mph flat-out. However, the Porsche Cayenne S gets an all-new 2.9-litre motor with a pair of turbos, so peak power output is 434bhp and 406lb ft. This means 0-62mph in 5.2sec. As before, you’re able to specify the Sport Chrono Pack and this drops 0.3sec from the above 0-62mph sprints. It comprises Sport, Sport+, Individual drive modes with associated tweaking of the car’s character to suit. Sounds great. 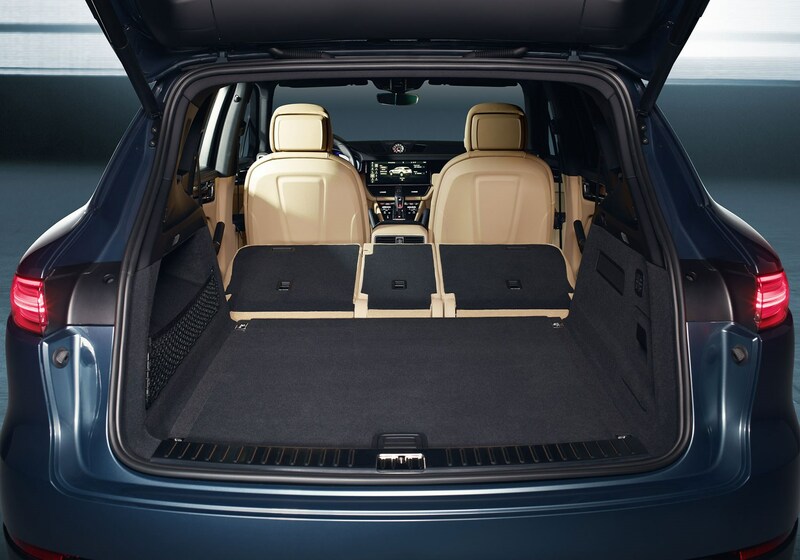 What else is new on the new 2018 Cayenne? The whole car’s been redesigned and measures 63mm longer and 9mm lower, yet retains the same wheelbase as before. The boot’s grown 100 litres to a substantial 770. It also uses staggered alloys for the first time (25mm wider at the rear than the front), which the firm claims will emphasise ‘the enhanced driving dynamics’. These sit in front of tungsten carbide-coated brake discs (also optional) that apparently offer a near-mythical cocktail of long life, low brake wear and less dust on your wheels to boot. We’ll believe that when we test it. 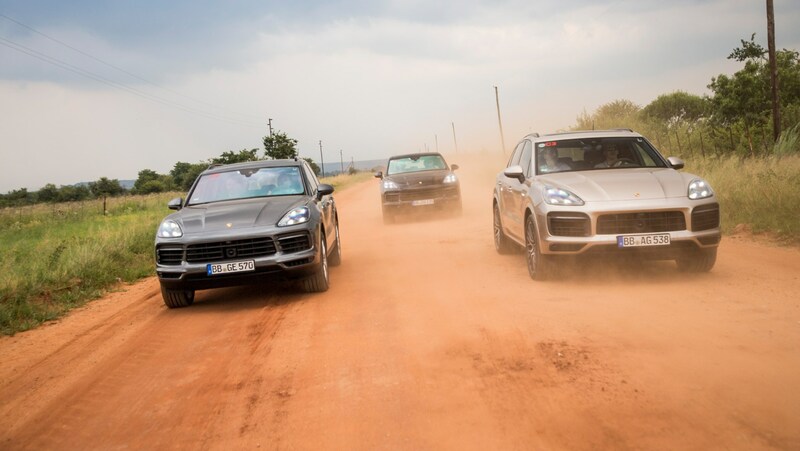 Carbon-ceramic brakes are still an option at the top of the range for those imaginative enough to consider using their Cayenne on the race track. 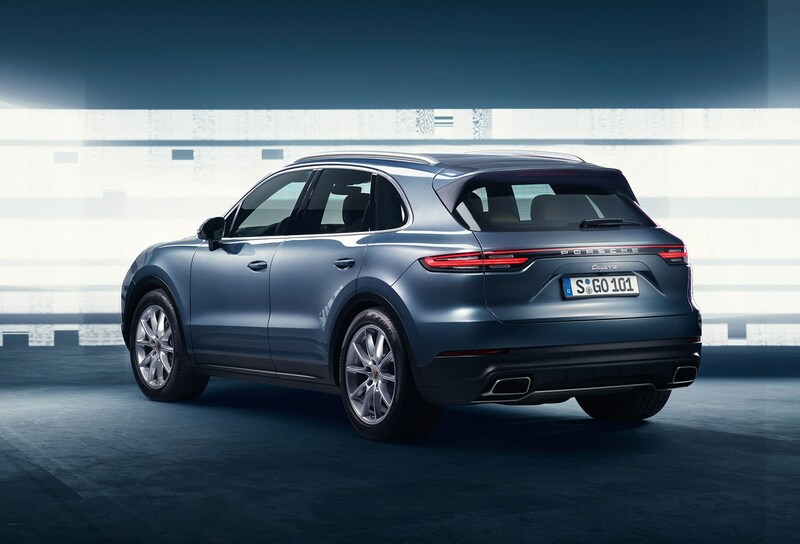 Lots of talk about driving dynamics, then, and clearly Porsche is try its best to retain its spot as the sportier option, even considering this family SUV is far more likely to be spotted on the school run than on the race circuit. 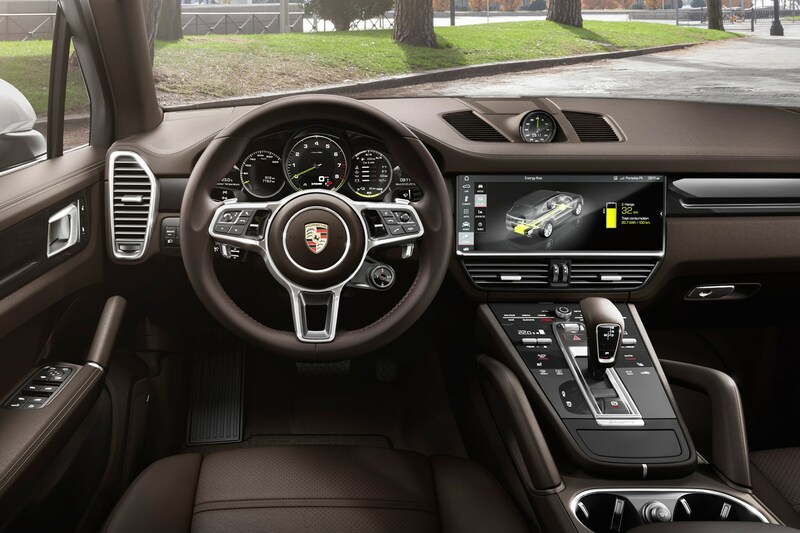 Multimedia duties are taken care of by a 12.3-inch touchscreen and the very same Porsche Communication Management (PCM) system as in the current Panamera. You also get an analogue tacho flanked by a pair of 7.0-inch screens as an instrument panel and a multifunction steering wheel to give you a fighting chance of controlling the myriad electric systems effectively. Any word on hotter or cleaner Cayennes? Fair question. In the past we’ve seen Cayenne pepper in the form of GTS, Turbo and Turbo S models, and it’s entirely likely we’ll see a full electric version based on the Mission E concept car. What about a Cayenne diesel? At launch the range comprises two petrol engines. Bosses wouldn’t be drawn on when (or indeed whether) a derv Cayenne will arrive. In engineering terms the infrastructure is there, but the agenda is very much headed towards PHEV and full EV drivetrains in development. In fact, during one chat with Porsche AG CEO Oliver Blume, the dreaded ‘D’ word was dismissed altogether. 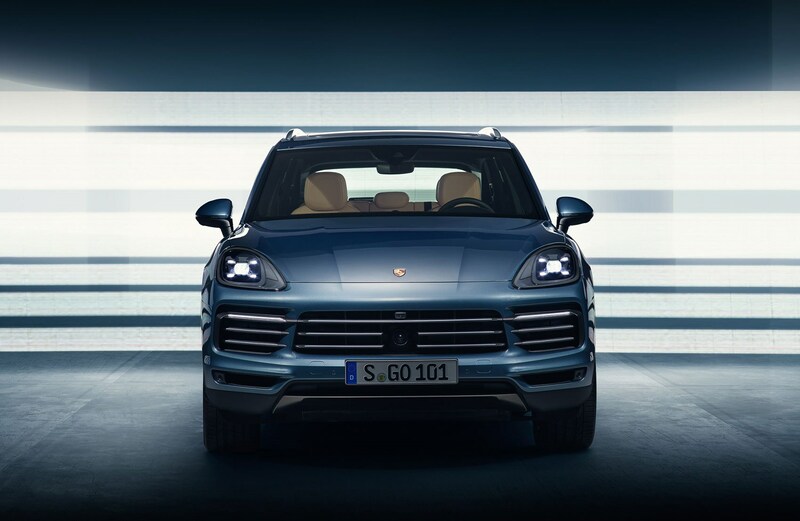 And while sales of diesel SUVs are relative strong in Europe, the Cayenne’s two biggest markets – China and the USA – favour petrol, and thus the two engines launched on this third-gen car. Pricing starts at £55,695 for a base-spec Cayenne, rising to £68,330 for the Cayenne S. Keep an eye out for a review later this year to get the full CAR verdict.